This mini city block is in a prime location in the City of London. The Client has considered carefully the possibility of redevelopment of the site. It is the Client’s desire to create a unified scheme which is befitting of this important entry point to the City of London via Liverpool Street to provide high quality retail at ground floor and basement and an iconic small office building to offer identifiable Headquarters accommodation for high profile medium size companies. 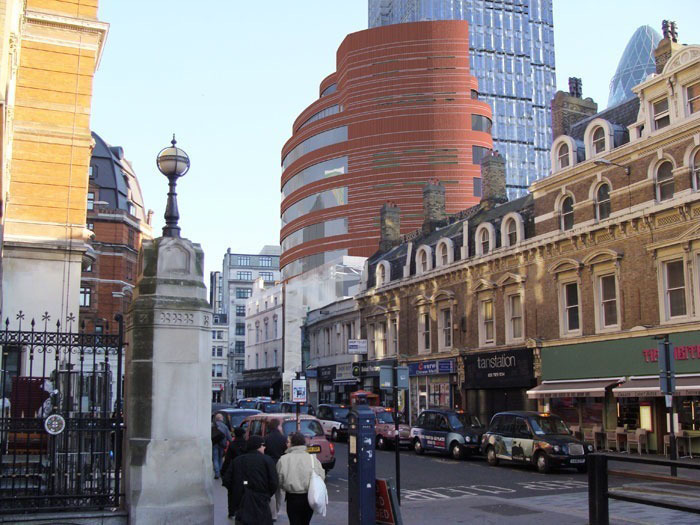 The proposed redevelopment of the site is to create a scheme, which rises above the height of the retained façade of the Georgian buildings facing Bishopsgate. 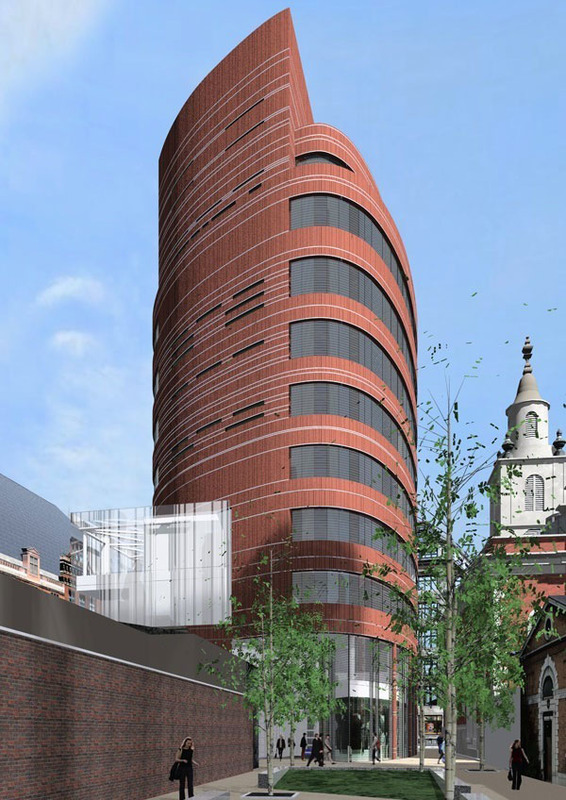 From the east and north the building takes on a cylindrical form, this form continues to the west and south elevation where the form extends down to the ground. 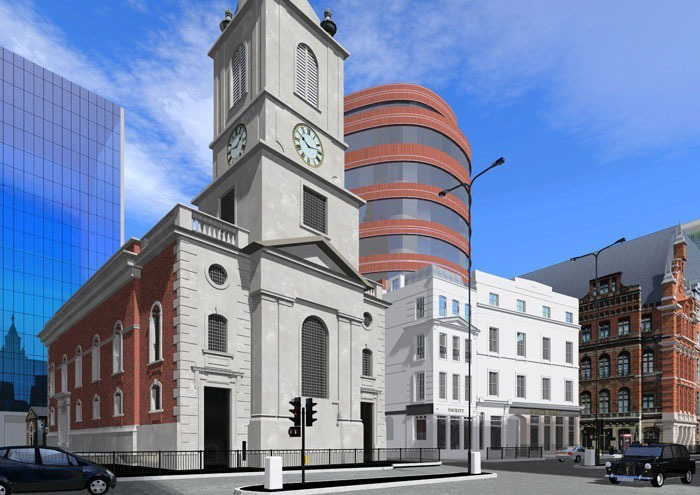 The rounded form of the new proposal unlike the rectilinear shape of the form at Alderman’s House allows the building to be read simply as viewed from each angle, the cylindrical form has a more classical relationship (in renaissance town planning terms) with St Botolph’s and other buildings within the conservation area. Although the curved form resolves each viewpoint, the form widens and narrows as one navigates the site. The sculptural form sometimes touching the ground to the south and west disappearing as the building sits back behind the historic façades. 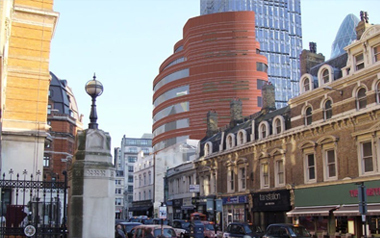 The mini tower element plays an important role in long views within the Conservation Area and this part of the City adding interest to the skyline and making key location of the corner of the two routes and by Liverpool Street Station within a wider urban landscape, the site planning and careful use of materials and detailing ensures however that both these elements can be read within the townscape as part of a coherent whole.